Indiansk, spansk: 1. Etnisk begreb fra caddo-sproget fra Hasinai indianerstammen i det østlige Texas, oprindelig stavet Tejas, i flertal, taysha "venner, allierede". 3. Historisk nordamerikansk republik, 1836-1845 med grænser til Mexico og USA og med kystlinje til Mexicobugten. Efterfølgende 1845 del af USA. 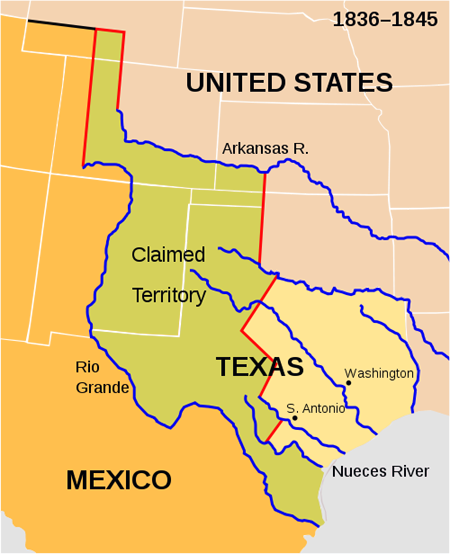 Staten Texas bestod ud over det nuværende landområde også af store dele af de nuværende amerikanske delstater Colorado, Kansas, Oklahoma, New Mexico og Wyoming reguleret af Velasco tratkaterne mellem Texas og Mexico fra 1836. Plant dieback under exceptional drought driven by elevation, not by plant traits, in Big Bend National Park, Texas, USA. by Waring, Elizabeth F.; Schwilk, Dylan W., 2014. PeerJ, volume 2. In 2011, Big Bend National Park, Texas, USA, experienced the most severe single year drought in its recorded history, resulting in significant plant mortality. We used this event to test how perennial plant response to drought varied across elevation, plant growth form and leaf traits. 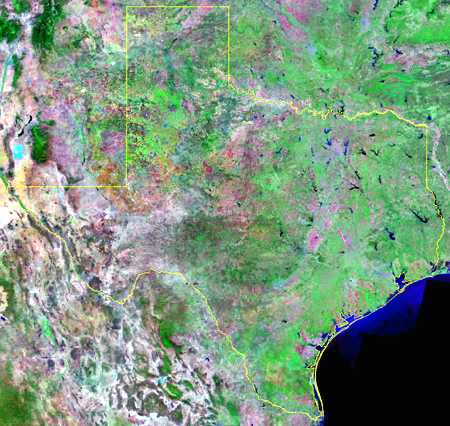 In October 2010 and October 2011, we measured plant cover by species at six evenly-spaced elevations ranging from Chihuahuan desert (666 m) to oak forest in the Chisos mountains (1,920 m). We asked the following questions: what was the relationship between elevation and stem dieback and did susceptibility to drought differ among functional groups or by leaf traits? In 2010, pre-drought, we measured leaf mass per area (LMA) on each species. In 2011, the percent of canopy dieback for each individual was visually estimated. Living canopy cover decreased significantly after the drought of 2011 and dieback decreased with elevation. There was no relationship between LMA and dieback within elevations. The negative relationship between proportional dieback and elevation was consistent in shrub and succulent species, which were the most common growth forms across elevations, indicating that dieback was largely driven by elevation and not by species traits. Growth form turnover did not influence canopy dieback; differences in canopy cover and proportional dieback among elevations were driven primarily by differences in drought severity. These results indicate that the 2011 drought in Big Bend National Park had a large effect on communities at all elevations with average dieback for all woody plants ranging from 8% dieback at the highest elevation to 83% dieback at lowest elevations. Aktuelle og historiske fredsgrupper i Texas. Texans for Peace, 1993.- tidligere Texans who believe in peace and Peace in Texas! Texas Music Office, Texas musikkontor fungerer som et kontaktsted for Texas musikindustri. Sitet indeholder mere end 15.000 virksomheder og bands. Det militærindustrielle kompleks i Texas. Se også: George W. Bush ; Stanley Hauerwas ; Lyndon Baines Johnson ; Messoamerika. Dobie, J. Frank: Guide to Life and Literature of the Southwest, 1952. America, its realities and resources : comprising important details connected with the present social, political, agricultural, commercial, and financial state of the country, its laws and customs, together with a review of the policy of the United States that led to the war of 1812, and peace of 1814--the "right of search," the Texas and Oregon questions, etc. etc. (1846). Lundy, Benjamin: The war in Texas; a review of facts and circumstances, showing that this contest is a crusade against Mexico- Philadelphia, Printed for the publishers by Merrihew and Gunn, 1837. Peace with Mexico. By Albert Gallatin (). Resolutions of the State of Texas, concerning peace, reconstruction, and independence : House of Representatives, Jan. 19, 1865.-Laid on the table, and ordered to be printed (1865). Stephenson, Nathaniel Wright: Texas and the Mexican war; a chronicle of the winning of the Southwest (1921). Stiff, Edward: A new history of Texas; being a narration of the adventures of the author in Texas, and a description of the soil, climate, productions, minerals, tons [! ], bays, harbours, rivers, institutions, and manners and customs of the inhabitants of that country; together with the principal incidents of fifteen years revolution in Mexico; and embracing a condensed statement of interesting events in Texas, from the first European settlement in 1692, down to the present time: and a history of the Mexican war (1847).